Every team has suffered injuries this season. I’m not trying to make the Pens the exception but they do lead the league in injury statistics: 503 Man games lost so far this season. Somewhere amid broken bones, concussions, wrist injuries, blood clots, a stroke and a season ending knee injury the Penguins have endured this season to easily clinch the Metropolitan Division and sit in seventh place over all in the NHL. Despite having to constantly move personnel from their AHL affiliate, the Penguins have the NHL's second best power play and fourth-best penalty killing. They rank second in the East in goals. According to mangameslost.com, the Penguins are off the charts in their injury parade. Their total is 93 games more than the second-place Detroit Red Wings. No other team was within 150 games of Pittsburgh's total.To understand how many injuries the Penguins have had this season, all you need to know is that third-line center Brandon Sutter has played with 17 different wingers this season. That number is utterly ridiculous. At one point at the end of November, the Pens were missing 5 regular defensemen. Matt Niskanen was the top defenseman leading four AHLers and rookie Olli Maatta. When you survey the data from around the league, it’s clear to see Pittsburgh has suffered a disproportionate number of injuries compared to the rest of the NHL. (We aren’t whining, it’s statistically true) What’s also clear is that they have managed to keep pace with teams who haven’t had to make do without their stars. NBC analyst Pierre McGuire told Detroit Free Press , "The Penguins win because their star players set the standard in practice," McGuire said. "They work hard and push others to come along. Their special teams have been all-world, so they dictate the terms in a lot of games." When asked about Crosby leading the league in scoring despite Pens’ injuries, "Crosby has been fantastic," McGuire said. "He does what superstars do. He makes the players around him better. He possesses the best backhand in the league and is the strongest player on the puck in the league." 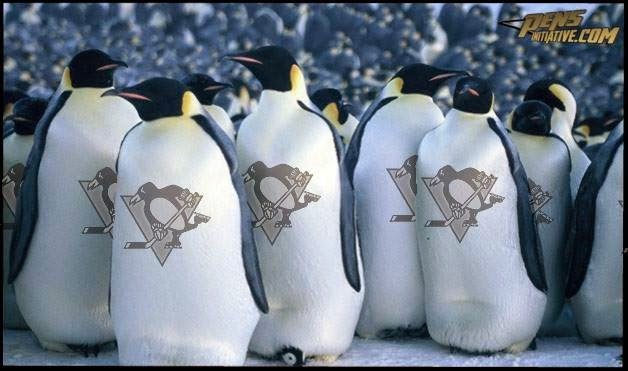 If all you ever knew about the Penguins was what you read on Twitter, you'd think they were a group of lazy, underachieving cellar dwellers. You wouldn't be amazed that Crosby is a lock for the Art Ross Trophy while playing on a team suffering from more than 500 man games lost. You certainly wouldn't think Dan Bylsma knew the first thing about coaching even though his mostly piecemeal team dominated the Metropolitan Division. Thank the Hockey Gods there's Twitter so all the hockey experts have a place to tell you just how embarrassing Sidney Crosby and the Penguins have been this season. 142 Number of consecutive games (inc. playoffs) played by Craig Adams, the current iron man streak for the Pens. 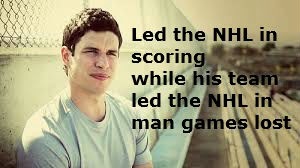 I just hope people remember this instead of starting the "Fire Bylsma" rants every time the Pens lose a couple games. I think the man games total is inflated because of Vokoun's illness/injury. It's hard to count a full season as lost from a guy who might have played 20 games at the most. But the point is well taken and it's a good piece.